I came across a wonderful article this morning on Medium entitled 7 Things Every Designer Needs to Know about Accessibility. If you are a software designer for an EHR vendor, or just interested in that sort of thing, I would highly recommend reading it. I will contend that the lessons listed in the article are pertinent to basic design in a healthcare setting where it is vitally important to display information and options in the most clear way manageable. 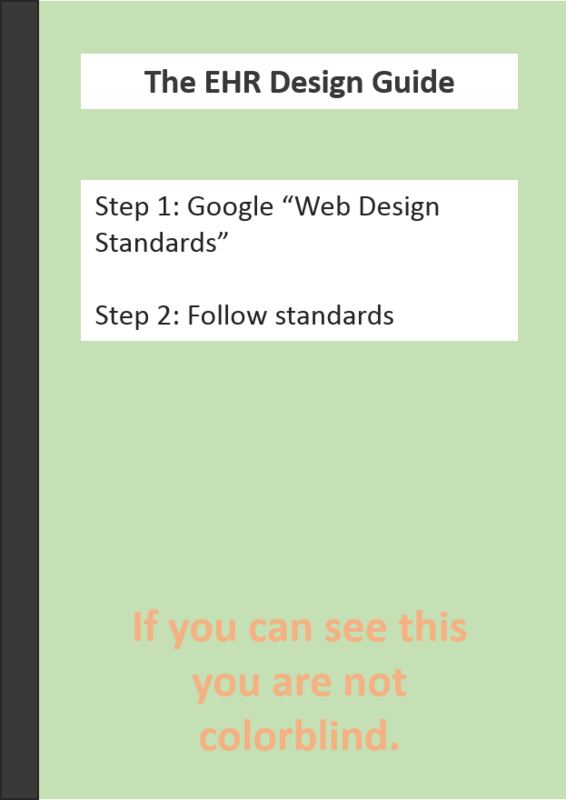 Additionally, existing web standards should be utilized where applicable. This would include Patient Portals as well. In fact, even if your product isn’t web-based, they are still great standards to use. Note: there is even an item addressing Dragon voice recognition. To date, I have not come across a single physician who has told me they really enjoy working with whichever EHR they are using. In fact, even the AMA has voiced this for all physicians. I have met plenty of physicians and other clinical staff who still drool over interacting with their iPhones though. Now, I get that the processes EHRs are trying to assist are inherently complex and that that’s a work in progress, but user design doesn’t need to be dealt with in a silo. I also get that there are EHR vendors that hire software designers that don’t have any prior software design experience. However, there are a number of resources and good examples out there to follow. As EHRs are continually pushed to all deliver the same functionality, one with good user design may be able to sway an organization to at least not choose Epic. And if you’re excuse is that you’re proprietary technology won’t let you adhere to existing standards…then you might want to stop listing “Proprietary” as one of your selling points.